Thirty groups met on November 1st 2017 at the Social Development Centre to talk about our common challenges and strengths. We all agreed that the "Small Groups Networking" would make things easier: wider promotion, robust recruitment and accessible space for meetings and events! You can see the report from this meeting. Some of us wanted to continue the conversation and look for the source of funding and support to make the idea of the Civic Hub come to life. 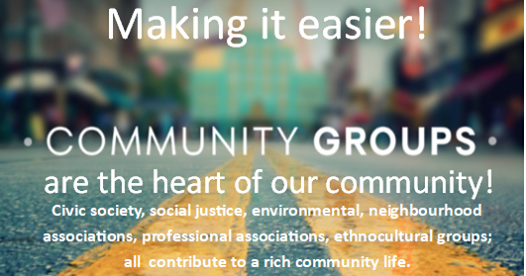 This March, we crafted this vision statement: "A home, a landmark, accessible to everyone interested in civic and grassroots groups to showcase what is being done in the community, to allow groups to support each other, recruit, communicate and build their credibility and capacity for advocacy and delivery of services to the public." In order to prepare for a soft launch, we would need you to answer these brief questions on behalf of your organization or group. If you know of other groups and organizations that would benefit from the initiative, do share the survey and the invitation to the meeting.